I used to live with a sax player who always played a descending Eb major scale whenever he got the instrument out. A thing like that might be useful if you can notice it for yourself. Perhaps you do something similar? Do you tune up? hit an E chord? play a familiar lick? For example, say your habit was the Eb scale and you wanted to get the diminished scale under your fingers. 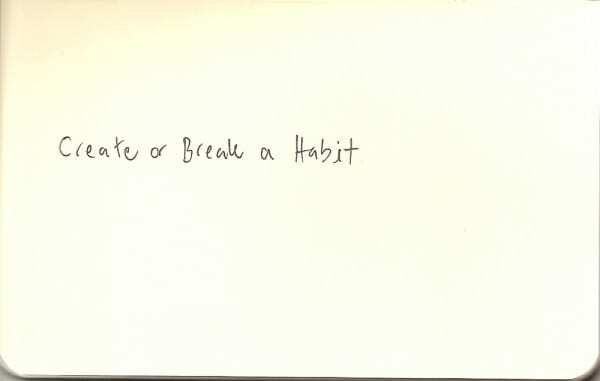 Just replace the old habit with a new one. Make that the very first thing you do whenever you first touch the instrument. Or, you could take your habitual things and break them. Instead of always starting with Eb, play a different scale, or do it ascending or in intervals, or, and this is a great habit to get, always start by searching for something new. Also, you could take those times when you do the same thing every day: put the kettle on, brush your teeth, open the computer, whatever it is, and do something then. I guess that’s the kind of thing you do when you’re 15 and obsessed with practising, but there’s no good reason I can think of why you wouldn’t, say, recite the formulae for the melodic minor modes whilst operating a lathe. That’s ok, no?